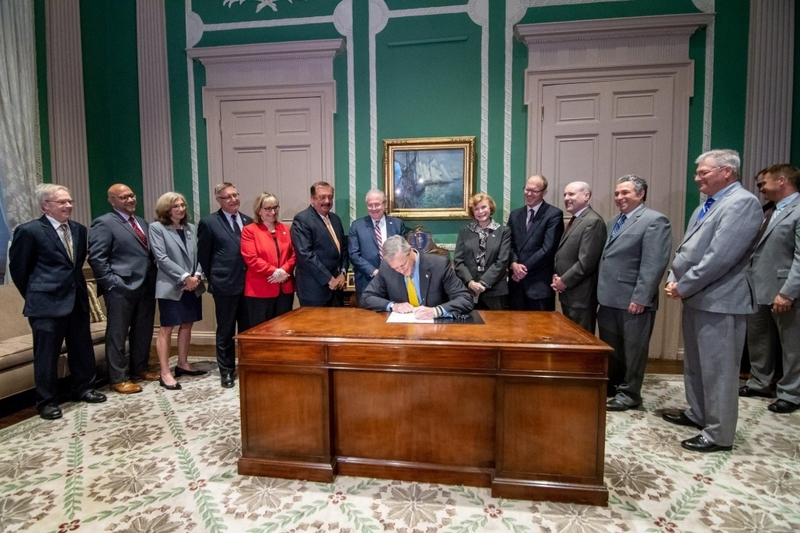 BOSTON— Senator Jason Lewis and Representative Paul Brodeur, who serve as Co-Chairs of the Committee on Labor and Workforce Development, led a successful effort to create a new paid family and medical leave program in Massachusetts. 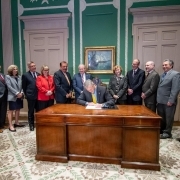 The legislation was signed into law on June 28 by Governor Charlie Baker. Once the program is fully implemented, almost all workers in Massachusetts will have access to job-protected paid time off from work to take care of themselves or a seriously ill family member or to bond with a new child. The majority of workers in Massachusetts, particularly low wage workers, currently have no access to paid leave benefits. Having access to paid family and medical leave benefits will help families deal with medical crises; reduce inequality in the workplace for women and low wage workers; help small businesses compete for talent with larger businesses; reduce employee turnover; retain more women in the workforce and help them advance; promote infant and maternal health; and reduce reliance on public assistance programs. The legislation provides up to 12 weeks of paid family leave to care for a new child or a seriously ill or injured family member, and up to 20 weeks of paid medical leave for a worker to recover from his/her own serious injury or illness. Workers must meet certain eligibility and certification requirements to ensure program integrity. While on leave, a worker will receive partial wage replacement up to a maximum weekly cap of $850 (which will be adjusted upwards over time). The bill prohibits employer retaliation against workers who take leave, and ensures that a worker is restored to his/her previous position, or to an equivalent position, with the same status, pay, and employment benefits. The benefits will be paid from a newly established Family and Employment Security Trust Fund, which will be funded from payroll contributions, split roughly equally between employers and employees. Small businesses with fewer than 25 workers will be exempt from payroll contributions. The signing of this legislation into law is the culmination of an almost year-long process led by Senator Lewis and Representative Brodeur. In their role as Co-Chairs of the Labor and Workforce Development Committee, they brought together stakeholders from Raise Up Massachusetts and leaders of the business community to work closely together to design a paid family and medical leave program that would meet the needs of workers while addressing the concerns of employers. As a result of this successful effort, Raise Up Massachusetts announced that they would no longer pursue a ballot question to establish paid family and medical leave, removing substantial uncertainty and risk for all stakeholders. Employer and employee contributions for paid family and medical leave will begin in July, 2019, and benefit payments will begin in January, 2021.